If you use a Web-based email program such as Yahoo Mail or Gmail, I'm sure you've seen a series of advertisements that use ridiculous pictures to capture your attention...and more times than not, the pictures have nothing to do with the advertised product or service. Here's one I recently found on my Yahoo Mail account. 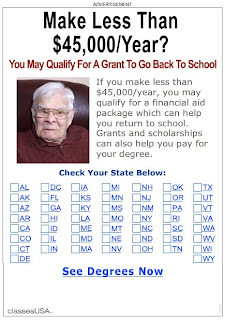 This old guy looks really constipated, which I guess is what happens when you discover that you may qualify for financial aid. And apparently great minds think alike. Yesterday I received this ad from a Gallery watcher, Brynn. It's the exact same image, but this time it's paired with a housing relief program. Maybe this guy isn't constipated. Maybe he just accidentally sat on a cucumber.